What, you getting a workout on the kid’s cubby house? Oh yes you can, believe it or not. 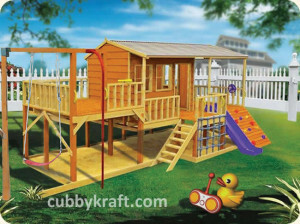 Your kid’s backyard playground can turn into your playground too…well the type that gets you fit. I recently saw an article where moms and dads were spotted hanging around kids playgrounds during the day when the kids were at school. Why in the world were they there as playgrounds are for kid’s right? They don’t have to be, these moms and dads weren’t just hanging around for fun they were actually exercising. 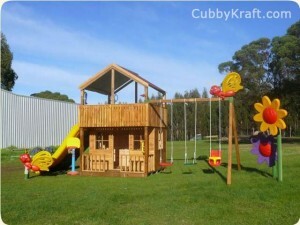 So if a playground can be an exercise heaven, so can your kid’s cubby house. And another positive, you don’t have to pay for a gym membership! A recent study published in the American Journal of Preventative Medicine showed that adults would exercise more if they had access to a playground. 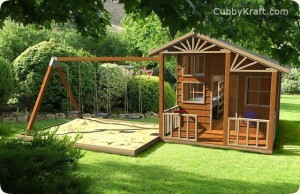 Here are some ideas on how a cubby house can get those muscles of yours into shape too. Sit-ups; lie on the slide with your head towards the bottom so that your feet are above your head, bend your knees so your feet are flat on the slide and put your hands one on top of the other at the base of your skull. Keeping your elbows wide, lift up into a crunch. Pull-ups or chin-ups; grab a bar with your palms away from you (pull-up) or facing you (chin up). Pull your shoulder blades back and downward, keep your core tight, and pull your chest up towards the bar. Grab the ropes on the swing, lean back and make your body tight and straight and use your back and arm muscles to pull yourself up. Atomic Push-up; start in a push-up position with your hands on the ground and your feet on top of the seat of the swing. Keeping your core tight and your lower back stable, bring your knees toward your chest, then reverse the movement. Follow with a push-up, holding your body in a straight line and your elbows tucked tight to your sides. Mountain Climber; begin in a push-up position with your palms on the seat of the swing and your feet on the ground. Keeping your lower back stable, bring one knee in toward your chest then return it to the starting position. Climb up the pole; starting at the bottom, use your arms and legs to pull yourself as far as you can before jumping (or sliding) down and starting again! 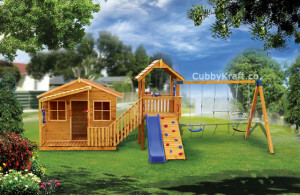 So, there you have it – a gym right in your backyard and a kid’s best friend, the cubby house. Enjoy and have fun!